Magento is a powerful program that needs the same type of power in the hosting server, to run it successfully. Magento 2, the latest version is 15% faster. And has many additional features introduced like the 1-Click checkout. However you still get just the program without the host. UK Magento hosting needn’t be a sticky situation; you just need to find a compatible host. Let’s look at four powerful ways Aspiration Hosting fits. Although there are different ways, you can host your Magento store, cloud is the best option. Aspiration Hosting has designed the cloud hosting plans in a manner akin to individual condos. You get your separate space along with resources which you can easily upgrade. You don’t have to be based in the UK to get a UK Magento hosting server. Choose the London server; else we have Singapore, Sydney and also California. The Stats speak for themselves – the eCommerce industry is growing in the UK. Just like being safe is a necessity in the real world, this same sense of security is needed online. Aspiration Hosting provides this by SSL certificates that safeguard all transmissions between the server and browser. Besides this, all Aspiration Hosting servers are also scanned using Malnet and ClamAV for malicious scripts. And Spam Expert for outgoing mails is also included in the cloud hosting plans. Whether your interest lies in dedicated cloud servers, the fully managed MagePlus or cloud hosting plans, expect more from your host. Who will you call in the hour of need? The customer care hoping to resolve the issue immediately. 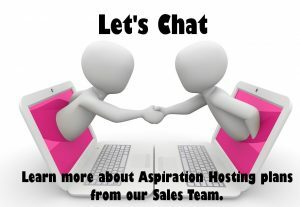 Aspiration Hosting has Magento experts giving support, 24*7, via Live Chat and also through tickets. Aspiration Hosting – feel the difference! Chat with us for more details.